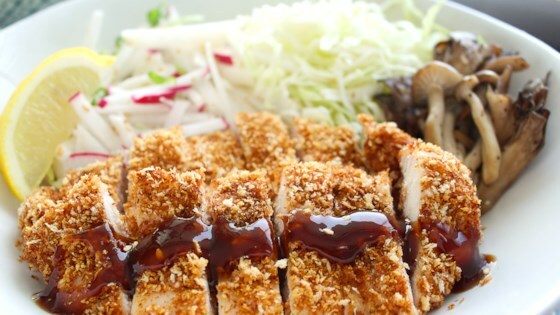 "This is my family recipe for Chicken Katsu - Japanese style fried chicken. Can also be used to make Tonkatsu, just use pork cutlets instead of chicken. Serve with white rice and tonkatsu sauce." A Japanese style pan-fried chicken. This was great! I absolutely love Panko bread crumbs...it is the best! I did make one alteration and that was to cook my chicken in butter. It was soooo good! Thanks for sharing your recipe.